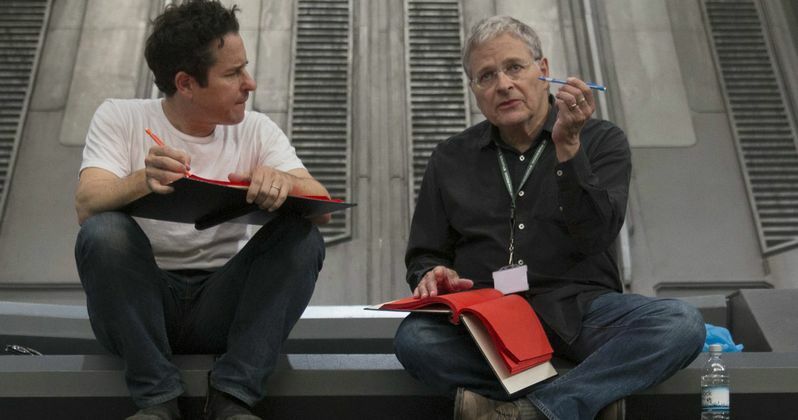 Shortly after Star Wars: The Force Awakens hit theaters last weekend, director J.J. Abrams and screenwriter Lawrence Kasdan held a Q&A session at the Director's Guild of America, where they shed new light on several aspects of this blockbuster. The director and screenwriter revealed several new details during this wide-ranging Q&A session, confirming that Alec Guinness and Ewan McGregor's voices were heard as different versions of Obi-Wan Kenobi, while Frank Oz also returned to voice Yoda. Today, the Director's Guild of America released the full video of the director and writer's Q&A session for everyone to watch, even if you weren't at the DGA last weekend. Right from the start, Star Wars: The Force Awakens was shrouded in secrecy, which spawned rumor after rumor from insiders and outsiders alike, all with new details on the casting, characters and the production, once principal photography got under way last year. Some of those rumors were proven to be true, such as the death of Han Solo, while others were proven false, such as the opening of the film featuring a lightsaber that falls from the sky and lands on the desert planet of Jakku. Now that Star Wars: The Force Awakens is finally here for all to see, director J.J. Abrams and writer Lawrence Kasdan shed some light on this immense sci-fi adventure, set in that beloved galaxy far, far away, filled with colorful characters, villainy and intrigue. Star Wars: The Force Awakens is just the beginning. This blockbuster will be followed by the first spinoff, Rogue One: A Star Wars Story, which is currently in production and set to hit theaters on December 16, 2016. Director Rian Johnson's Star Wars: Episode VIII is slated for release on May 26, 2017, with Star Wars Anthology: Han Solo Movie arriving on May 25, 2018 and Star Wars: Episode IX premiering sometime in 2019. Lucasfilm is also developing a Third Star Wars Spin-Off Movie, which is presumably set to arrive in 2020. Star Wars: The Force Awakens debuted domestically and internationally in nearly every market, except Greece and India, which open Dec. 24, and China, which opens Jan. 9. Take a look at this extensive 32-minute video featuring the write and director of Star Wars: The Force Awakens, and stay tuned for more on this sci-fi blockbuster. Are there any other aspects of Star Wars: The Force Awakens you want to know more about before you go see it again?